The latest report from our Continuous Update Project (CUP), the process by which we rigorously review the global science linking diet, weight and physical activity to various cancers, focuses on the prevention of prostate cancer. We released it last night; this press release reviews the highlights, and takes you to the full report. 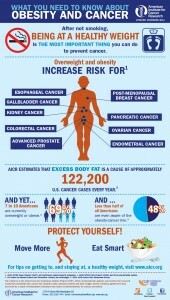 One new finding is that obesity is now recognized as a risk factor for advanced prostate cancer – the most deadly type. Like all previous CUP Reports, Diet, Nutrition, Physical Activity and Prostate Cancer gives our expert panel the chance to review the research collected since the publication of our 2007 AICR/WCRF expert report, and to update their judgments about the strength of the evidence on specific links. Which, this time at least, is just what they did. revealing how quickly the field of prostate cancer research has changed in just seven years. Prostate Cancer Is Not One Disease – The panel’s judgments on specific links have changed because prostate cancer is now being studied differently than the way it was in 2007. Today, researchers know that not all prostate cancers are alike. Widespread PSA screening has resulted in the diagnosis of thousands and thousands of prostate cancers. Most of these prostate cancers will never become life threatening, while others are highly aggressive and deadly. These cancers have different underlying causes, treatments, and prognoses. Yet back in 2007, most of the studies that looked for links between specific dietary factors and prostate cancer treated all prostate cancers the same. Today, researchers who design prostate cancer studies know that to provide meaningful results, they need to separate out the various kinds of prostate cancer that we now know exist, and consider each as a separate subgroup. But doing so means that when our expert panel weighs the evidence today, the numbers of cases of prostate cancer they’re looking at in each subgroup is much smaller than it was in 2007, when all prostate cancers we considered together. And that means the statistical power – the ability for the data to strongly demonstrate that a given link exists – is in many cases weaker than it was before. In 2007, the panel judged that strong evidence supported the hypothesis that foods containing lycopene, like tomatoes and watermelon, were protective against prostate cancer: they judged the link “probable.” They did the same for foods containing selenium. Back in 2007 they found strong evidence in the other direction as well: diets high in calcium were judged to increase risk for prostate cancer – this link also fell into the “probable” category. Today, however, the new judgments from the panel significantly downgrade all of those previous judgments into the “limited evidence” category – meaning they’re not strong enough to base official Recommendations for Cancer Prevention on. This doesn’t mean, however, that those links now suddenly have ceased to exist – it just means that given what we’ve learned about prostate cancer, and given the weakened statistical power of the studies, our panel can no longer say definitively that lycopene, selenium and calcium play clear, demonstrable roles in prostate cancer risk. As more studies come in, and there are more cases of prostate cancer in each subgroup, our ability to make clear judgments will grow. But even as the evidence gets cloudier around specific dietary components, one new factor has emerged clearly and consistently from the data. It’s a factor that barely made an impression when the data on prostate cancer were originally considered back in 2007, and the evidence for its link to the disease was judged “limited – no conclusion possible” alongside 39 other dietary factors. Today, however, a surge in research on the role of obesity in cancer risk has resulted in excess body fat being recognized for its significant role in risk for many cancers. With the publication of our latest CUP Report, prostate cancer now joins the list of cancers known to be associated with overweight and obesity. And what’s more, because of the new understanding of prostate cancer, we now can say that carrying excess body fat specifically increases risk for one subgroup of the disease – the advanced, aggressive forms, which are often deadly. It would be nice to say that as research mounts, the links between dietary factors and cancer risk only grow more and more clear, but that’s not always the case. Cancer is a complex disease, and our research needs to account for that. That’s what the CUP attempts to do – to provide a means to ensure that our advice stays current and adaptable, and reflects our deepening understanding of the science of prevention. AICR Vice President of Research Susan Higginbotham, PhD, RD.